Pepco and University of Maryland officials, members of the original UMD student Watershed team, the Maryland Department of the Environment and the Chesapeake Bay Foundation joined together recently to open the Pepco WaterShed Sustainability Center, a "living classroom" dedicated to the education and research of sustainable energies, at the Pepco Holdings, Inc. Service Center in Rockville, Maryland. "This is very meaningful chapter for our team," said Amy Gardner, WaterShed's Principal Investigator and a clinical professor of architecture at UMD. "This project reflects not only our philosophy as architects, engineers, and environmental scientists and builders; it has shaped how we live as stewards of our environment. It's an honor to know that same spirit will live on and continue to influence and inspire people for years to come." The Pepco WaterShed Sustainability Center, which is open to the public, serves as a "living classroom" for sustainable energy practices that can be shared with Pepco customers. The home, which includes an additional educational wing constructed by team members and Pepco this past year, combines hands-on learning and interactive displays that educate visitors with energy-saving ideas they can apply in their own homes. The center is also a working laboratory for Pepco and the University of Maryland that focuses on energy efficiency and sustainable living. Showcasing new technologies, including smart thermostats, ground and rooftop mounted solar panels, electric vehicle charging ports and smart meters, WaterShed will continue its mission to educate the public on the beauty and versatility of sustainable design. Also on display are the many hallmarks of its winning design: a dual purpose "butterfly roof" that captures both sunlight and rain water; an indoor, liquid desiccant waterfall for high-efficiency humidity control; edible landscapes that promote community-based agriculture; and constructed wetlands, which cleanse both stormwater and greywater for reuse. "We are excited to provide access to new technology and valuable information to our customers on how to reduce energy usage and lower their monthly bills," said Karen Lefkowitz, Vice President, Business Transformation, PHI. "The University of Maryland students and faculty have done something special and created an award winning platform that will help educate and benefit our customers, and ultimately the environment with its sustainability ideas for many years to come." WaterShed took first place at the U.S. Department of Energy Solar Decathlon 2011, an international competition that challenges collegiate teams to design, build and operate solar-powered houses that are cost-effective, energy efficient and attractive. The Maryland team—the only finalist from the state and the Washington, D.C. area – combined the talents of UMD students, faculty and professional mentors from a variety of disciplines and professions, including the School of Architecture, Planning and Preservation, the A. James Clark School of Engineering and the College of Agriculture and Natural Resources. WaterShed wowed juries and audiences alike for its dual focus on both solar energy efficiency and water conservation. The house placed in the top four for all juried contests and finishing the competition with the highest point percentage ever awarded at the Solar Decathlon. Since their win, WaterShed has received numerous awards and recognition on regional, national and international stages for its sustainable and affordable design model. 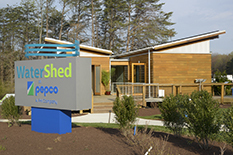 The Pepco WaterShed Sustainability Center is located at 201 West Gude Drive in Rockville, Maryland and is open to the public for guided tours Monday through Friday 10 a.m. to 3 p.m.